Patricia M. LoRusso, DO, has felt the devastation of cancer. As a teen, LoRusso lost her father to lung cancer and her mother to lymphoma. That experience shaped her outlook and drove her to find innovative ways to treat cancer. 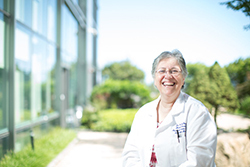 Today, in addition to being an American Association for Cancer Research (AACR) board member, LoRusso is the associate director of Innovative Medicine at Yale Cancer Center, where she leads a team of clinical investigators connecting patients in clinical trials with the best therapeutics. By doing so, LoRusso and colleagues are helping safe and effective treatments get approval for use in patients. A major challenge for clinical researchers is the low number of adults who participate in clinical trials, which is key to progress against the myriad of diseases we call cancer. Despite spectacular progress against these diseases, with an estimated 595,690 people living in the United States expected to die of cancer in 2016, there is an urgent need to advance new treatments. Support of cancer researchers is critical to realizing the promise of recent discoveries and technological advances. That’s why the AACR has developed a campaign to highlight the work of Cure Drivers – cancer researchers like LoRusso – and the impact of that work to help more people live well beyond their cancer diagnosis – helping them become Cancer Thrivers, our family and friends who are thriving today thanks to advances in cancer science. In 2013, Renee Shine turned to LoRusso and her team after eight months of standard therapy failed to halt the 64-year-old realtor’s stage 3b lung cancer. With the help of a former client who worked in the pharmaceutical industry, Shine found a clinical trial for the immunotherapeutic pembrolizumab (Keytruda) at Yale. The drug had been approved for the treatment of melanoma and was viewed as a promising new approach for patients with non–small cell lung cancer, like Shine. In October 2015, the U.S. Food and Drug Administration approved pembrolizumab for patients who have advanced non–small cell lung cancer – the most common form of lung cancer, accounting for some 85 percent of the more than 220,000 cases each year in the United States – based on data from the clinical trial Shine participated in. For Shine, research has been key to getting her back to the active life she loves. And she is hopeful and confident that she and other lung cancer patients who are benefiting from immunotherapy will have the sustained response seen in melanoma patients. Participating in the clinical trial made Shine a key player, and now she wants to support research that will help others impacted by cancer become Thrivers like her. Please donate today to support pioneering cancer research.